OK, so the U.S. isn't the absolute hands-down best at basketball anymore. We're dealing with that. Same as baseball, as we watched the championship game of the World Baseball Classic on TV, and noticed that of the two teams playing, one of them wasn't us. Eh. We'll get over it. But not this. No, not this. The Coney Island Hot Dog Eating Contest arrives tomorrow, and if we go down to defeat again, our national self esteem may not be able to handle the blow. The winner for the past five years — in the sport that we invented — has been Takeru Kobayashi of the diminutive, slender island of Japan. Just as when Larry took on "The Stomach" in the hot dog eating contest in the film Meatballs, we have to find a hero; someone who can win it all for the glory of Camp Northstar. That someone just may be Joey Chestnut, a 6-foot-1, 230-pounder from San Jose, Calif., who holds the U.S. wiener-eating record of 50 hot dogs in 12 minutes. Kobayashi holds the Coney Island record with 53 1/2 dogs on July 4, 2004. 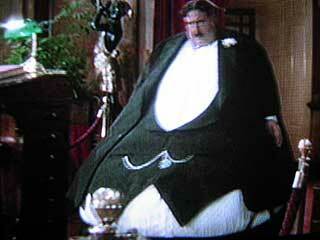 That's a total to impress even Mr. Creosote. So the stage is set for the Fourth of July. We cannot lose again. So eat, Mr. Chestunut. Eat like the wind!